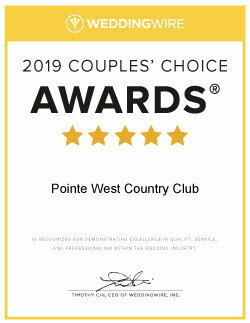 Pointe West Country Club is the perfect venue for your banquets and corporate outings. From casual barbecues to elegant weddings, from 15 to over 150 people, our banquet staff will skillfully handle all of the custom arrangements so that you can impress your guests and enjoy your party. The natural beauty of our golf course enhances photos and our audio-visual/internet amenities guarantee a successful business presentation. We are conveniently located near I-95 for easy access and will make your event planning a pleasure. *Packages may be customized to suit your personal needs. Click here to receive more wedding information.